I can feel winter slowly but surely creeping in, just a puff of steamy breath here and there or the faint smell of snow blowing past. My favorite season is coming, and I can finally wear my new winter coat I bought at a Uniqlo sale a few weeks ago. I also picked up my vintage dress from the tailor, and now it finally fits properly and I figured out how to make it easier for everyday wear by rolling up the pouffed sleeves. I'm so happy I have this dress fixed (it was too tight in the chest before) because its the perfect combination of floral, black velvet and interesting details like the ruffled neckline with a bow and ruffled hem. Now it can get the love it deserves. I wore it today to do some Christmas errands, hang out with LK and have a family dinner. New hair! New hair! If it ever got that cold in winter where I live I'd pretty much want to be wearing this outfit. i love the duffel coat! i almost bought a vintage one like it this weekend but the fit is never quite what i'm after. 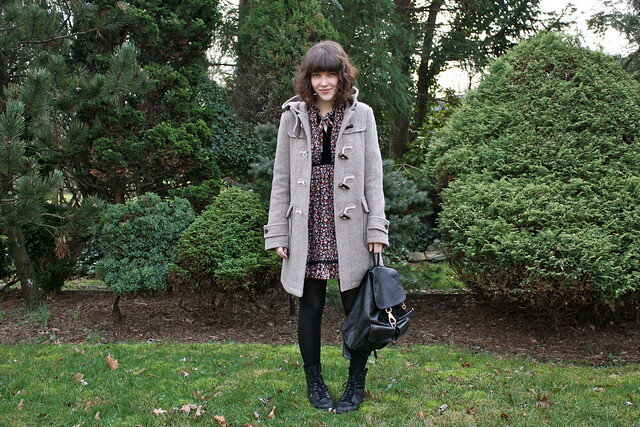 Cute dress and I love your coat! Duffle coats are my fav! I had the exact same issue, it was just never quite right so I just went for the first new one that had it haha. you look adorable with your new hair.... :) soso pretty. & this outfit is just perfect. i love the coat and the dress! Your hair is SO GOOD. Also, that dress looks fantastic on you. And don't even get me started on how great the coat is. I am so jealous of your duffle coat. It's a lovely color. Also, I love the vintage dress! I'm glad it could be alteredz, the floral print and velvet detailing are gorgeous. I really need to do some Christmas errands. Ahh. 13 days! The new hair looks awesome!! I hope Uniqlo this side of the pond sells that coat. Hello perfect. Your new hair is just so cute! And I'm glad this little dress has been resurrected; it's perfect for bringing a little happiness to winter dressing! That duffle coat is adorable! Great coat. Great dress. Great hair. You hit the trifecta! I loooooove this outfit (an your new haircut, btw). I was going to buy that coat from Uniqlo! 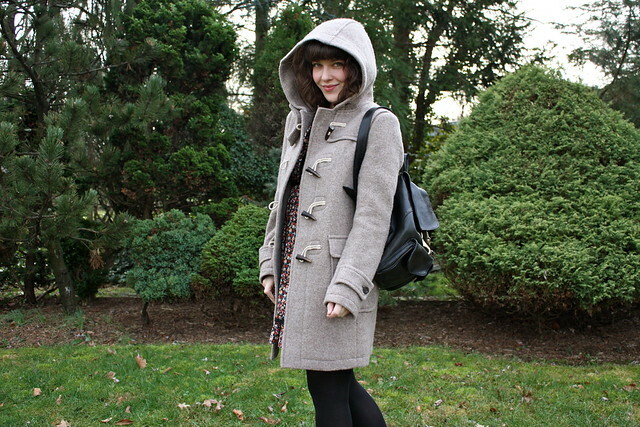 But since I already have a beige duffle coat (although it's more camel ;) ) I opted for another one, and in black. Tough I still got my eyes on that one, maybe in the sales or next year. You styling it definitely made it gain some more points! your dress is adorable. I love the black outlining and your coat looks wicked warm and cute. Lovely colours. And duffels are just the best coats ever. cute dress and i LOVE the coat! That dress looks absolutely adorable on you! I love the black tights and boots with it. That's great that you got that dress fixed so you could wear it! It's always nice when we find a vintage item that fits just right, but most of the time it won't! It looks amazing on you! really like what you did with your hair. something fresh!